You can be confident that the massage services you receive at Evergreen Massage Therapy are medically based and completely professional. Each one of our therapists is a Licensed Massage Practitioner (LMP). You can verify our credentials by going to the Washington State Department of Health web site and performing a Provider Credential Search yourself. Or take that verification step by calling 360-236-4700. You can learn about current scientific research regarding the use of massage. The Massage Therapy Foundation works to advance the knowledge and practice of massage therapy by supporting scientific research, education, and community service. When you choose a Licensed Massage Practitioner, you can expect a safe and comfortable experience. 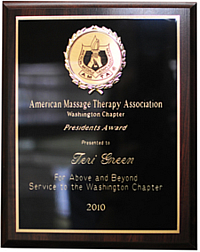 The therapists at Evergreen Massage Therapy are members of the American Massage Therapy Association or the International Massage Association. All of our therapists possess an AMTA or IMA certificate of insurance. Contact the Licensed Massage Practitioners at Evergreen Massage Therapy today for a free consultation or to schedule an appointment.